Lightweight, contour grip, Hi-Viz orange case is easy to find and fits comfortably in hand. Slide lock design allows for easy control of tape blade, wide base helps keep tape standing upright, removable belt clip and easy-to-read yellow clad blade (not replaceable). Trim and lightweight metallic colored ABS case with durable key ring for convenience. Yellow, blade lacquer-coated for added rust protection, slide lock keeps blade extended as needed. ABS plastic housing with comfortable rubber shell grip. Comfortable rubber coated thumb lever. Lightweight, contour grip, Hi-Viz orange case is easy to find and fits comfortably in hand. Slide lock design allows for easy control of tape blade, wide base helps keep tape standing upright, removable belt clip and easy-to-read yellow clad blade (not replaceable). Slim, metallic-colored ABS case fits perfectly in a pocket. Back of blade provides scale that measures up to 3' diameters; special Tru-Zero hook does double duty as a pivot for drawing circles and arcs Heat-treated spring stands up to regular use; Polymer-coated blade for long life. High impact, high-visibility yellow case stands, High-contrast blade for easy readability with a 7' standout. Coated blade for durability, helping prevent blade breakage. Comfortable ergonomic grip. High impact, high-visibility yellow case stands, High-contrast blade for easy readability with a 7' standout. Power return feature, with automatic bottom lock, streamlines tape operation. Yellow, high visibility case with belt clip on back. Special Tru-Zero hook does double-duty as a pivot for drawing circles and arcs. Polymer coating and heat-treated spring extend life. Pocket size ideal for office or home. High strength black case. Yellow clad blade is flexible with bold graduations on yellow background. Black markings one side only. Consecutive inches to 1/16ths bottom edge, first 12" to 1/32nds; 16" centers designated by diamond; every 12th inch in red. Lightweight, high strength, Hi-Viz orange case easy to find on the job; fits perfectly in the hand and into most tape holsters. Bright yellow blade has clear easy-to-read numerals with cushioned blade return. Removable belt clip. Toggle lock is positioned for convenient operation and holds the blade securely. Entire blade coated with heavy-duty Mylar polyester film for unbeatable durability. Two-rivet, corrosion-resistant hook stands up to continuous use. Special Tru-Zero hook does double-duty as a pivot for drawing circles and arcs. Die cast metal case. Power return feature, with automatic bottom lock, streamlines tape operation. Yellow, high visibility case with belt clip on back. Special Tru-Zero hook does double-duty as a pivot for drawing circles and arcs. Polymer coating and heat-treated spring extend life. Pocket size ideal for office or home. High strength black case. Yellow clad blade is flexible with bold graduations on yellow background. Black markings one side only. Consecutive inches to 1/16ths bottom edge, first 12" to 1/32nds; 16" centers designated by diamond; every 12th inch in red. High impact, high-visibility yellow case stands, High-contrast blade for easy readability with a 7' standout. Entire blade coated with Mylar polyester film for durability. Heat treated spring stands up to repeated usage, positive blade lock won't creep, graduated in 16ths of an inch. Special Tru-Zero hook does double-duty as a pivot for drawing circles and arcs. Belt clip on back of case. High impact, high-visibility yellow case stands, High-contrast blade for easy readability with a 7' standout. Durable bi-material case with belt clip. Self locking blade with fractional read blade graphics, magnetic end hook and Tru-Zero hook for accuracy. Lightweight, contour grip, Hi-Viz orange case is easy to find and fits comfortably in hand. Slide lock design allows for easy control of tape blade, wide base helps keep tape standing upright, removable belt clip and easy-to-read yellow clad blade (not replaceable). High impact, high visibility yellow case with high-contrast blade for easy readability. Three-rivet, corrosion-resistant hook moves to allow accurate inside/outside measurements; 7' standout. Power return feature, with automatic bottom lock, streamlines tape operation. Yellow, high visibility case with belt clip on back. Special Tru-Zero hook does double-duty as a pivot for drawing circles and arcs. Polymer coating and heat-treated spring extend life. Automatic blade lock holds the blade in extended position. Orange ABS case with a non-slip co-molded rubber grip, steel reinforced end hook, durable clear coat blade protection and recessed lock release. Nylon bond blade protection; 5-point reinforced frame; fractional scale; optimized hood designed for scoring; stamped steel belt clip; lanyard ready. Entire blade coated with heavy-duty Mylar polyester film for unbeatable durability. Two-rivet, corrosion-resistant hook stands up to continuous use. Special Tru-Zero hook does double-duty as a pivot for drawing circles and arcs. Die cast metal case. Easy readability, 7' standout, secure blade lock won?t creep. Special Tru-Zero hook does double-duty as a pivot for drawing circles and arcs. Entire blade coated with Mylar polyester film for added durability, heat-treated spring stands up to repeated use, 16" and 19.2" stud center markings. Three-rivet, corrosion-resistant hook moves for accurate inside/outside measurements. High impact, high visibility, yellow ABS case houses thick, wide yellow blade coated with polymer for enhanced durability; easy-to-read markings. Easy-wind drum ensures streamlined usage. End hook recoils neatly into contoured case. Graduations printed in fractions and decimal equivalents. Rounded blue ABS case fits your hand for comfort and withstands rugged use on the job site. Positive toggle lock holds blade securely at any length. Self-compensating end hook for inside and outside measurements. Built in bumper reduces shock when blade is retracted. Lightweight, high strength, Hi-Viz orange case easy to find on the job; fits perfectly in the hand and into most tape holsters. Bright yellow blade has clear easy-to-read numerals with cushioned blade return. Removable belt clip. Toggle lock is positioned for convenient operation and holds the blade securely. Auto lock brake. 5-point reinforced frame. Optimized hook designed for scoring. Lanyard ready. Zero tolerance hook. Nylon bond blade protection. Fractional scale and stamped steel belt clip. Universal lightweight long steel tape with high impact polystyrene case. Yellow clad blade .005"/0.13mm thick. Easy wind nylon drum; easy-to-read black and red markings. Hook ring is retained neatly in the contoured mouth of the case. Removable belt clip. Graduated feet and inches to 1/8ths with instantaneous readings; 16" centers indicated by a diamond. Magnetic end hook is a time-saver for framers, HVAC installers, and more. Powerful dual magnets can also serve as a pick-up tool. Orange with a non-slip, co-molded rubber grip, ABS case stands up to the toughest work site. Non-slip rubber blade lock button. Use for one-man measurements of steel framing and drop ceiling grids. Durable bi-material case with slip resistant rubber over mold with belt clip on back of case. AirLock rubber slide lock, multi-catch hook,Tru-Zero hook with nail head slot. Accurate interior and exterior measuring with large, easy to read blade graphics, nail slot for measuring radius, 10' blade standout. "Drag Strip" finger access for measuring and retraction control; wide end-hook holds better and makes marking easier; new blade design achieves 10' stand-out, make longer measurements; clearcoat blade protection - more durable markings; durable case allows for added control and grip; integrated D-ring for tether strap or easy handling storage; easy on/off belt clip for fast attachment to belt; blade graduated in 32nds for first 12 inches. Well suited for all types of layout and measuring work. The 10' blade standout makes it easy to take those long measurements without the need of an extra set of hands. The blade itself is covered with a protective Mylar coating that helps it resist chipping and cracking. Power return feature, with automatic bottom lock, streamlines tape operation. Yellow, high visibility case with belt clip on back. Special Tru-Zero hook does double-duty as a pivot for drawing circles and arcs. Polymer coating and heat-treated spring extend life. Has lots of great features that make it easy for professionals and DIYers to take accurate measurements; with a chrome plated case and a polymer coated blade, you are ensured years of heavy duty use. This tape offers 7' standout; it has a multi-catch hook for versatility with a Tru-Zero hook for accurate inside and outside measurements. Rugged rubber over-mold for impact resistance; 10' Blade Standout for reach and efficiency; Tylon blade coating for durability and long blade life; "Tru-Zero" end hook for accurate measurements; high impact case design for durability. Chrome-coated, high impact ABS case with rubber grip for increased durability, high impact resistance and better blade protection. The nylon-coated blades provide extended blade life and increased readability. The true-zero, 3-riveted hook offers superior strength. The positive blade lock and reverse button are standard. All have a handy belt-clip. High impact, high visibility, yellow ABS case houses thick, wide yellow blade coated with polymer for enhanced durability; easy-to-read markings. Easy-wind drum ensures streamlined usage. End hook recoils neatly into contoured case. Graduations printed in fractions and decimal equivalents. Rounded blue ABS case fits your hand for comfort and withstands rugged use on the job site. Positive toggle lock holds blade securely at any length. Self-compensating end hook for inside and outside measurements. Built in bumper reduces shock when blade is retracted. Open four arm frame design protects blade, does not trap dirt in case. Lightweight, strong, easy to handle and rewind, orange case is easy to find and two material grip is comfortable to use. Yellow clad fiberglass blade impervious to moisture. Folding end hook for true-zero measurements. Feet and inches graduated to 8ths; numbered feet and instantaneous feet. Easy readability, 7' standout, secure blade lock won?t creep. Special Tru-Zero hook does double-duty as a pivot for drawing circles and arcs. Entire blade coated with Mylar polyester film for added durability, heat-treated spring stands up to repeated use, 16" and 19.2" stud center markings. Three-rivet, corrosion-resistant hook moves for accurate inside/outside measurements. Lightweight, high strength, Hi-Viz orange case easy to find on the job; fits perfectly in the hand and into most tape holsters. Bright yellow blade has clear easy-to-read numerals with cushioned blade return. Removable belt clip. Toggle lock is positioned for convenient operation and holds the blade securely. Auto lock brake. 5-point reinforced frame. Optimized hook designed for scoring. Lanyard ready. Zero tolerance hook. Nylon bond blade protection. Fractional scale and stamped steel belt clip. Features two front-facing magnets allowing it to easily connect with any metal object as ceiling grids, studs, beams or HVAC ductwork; nylon coated for extra durability; the double sided blade features large 3/8" markings for quick readings of both elevations and flat surfaces; the high visibility scale is graduated in 1/16" increments. Decimal scale tape rule with die cast metal case; blade coated with heavy duty Mylar polyester film for durability. Two rivet, corrosion resistant hook stands up to continuous use. Special Tru-Zero hook does double duty as a pivot for drawing circles and arcs. Lightweight, orange, high strength case fits easily into most tape holsters. Bright yellow blade has clear easy-to-read numerals. Toggle lock is positioned for convenient operation; holds the blade securely in any position. Virtually unbreakable Quad Hook; four rivets for extra strength. Cushioned blade return. Removable belt clip. Case designed to fit your hand with a soft touch lock button for better feel and control. Orange/black rubber cushion absorbs impact and improves grip. Non-slip slide lock for positive blade locking, 10' stand-out, clearcoat blade protection 4-rivet end hook and easy on/off belt clip for fast attachment to belt. Has lots of great features that make it easy for professionals and DIYers to take accurate measurements; with a chrome plated case and a polymer coated blade, you are ensured years of heavy duty use. This tape offers 7' standout; it has a multi-catch hook for versatility with a Tru-Zero hook for accurate inside and outside measurements. Easy readability with wide blade and 8' tape standout. Blade Armor coating on the first 6"; entire blade coated with mylar polyester film, 16" and 19.2" stud center markings simplify framing jobs. Smaller than PowerLock Classic Tapes, making it perfect for smaller settings. Three-rivet, corrosion-resistant hook moves for accurate inside/outside measurements. Forward blade lock simplifies locking and unlocking the blade. Wear plate protects case from cuts and nicks. Lightweight, high strength, Hi-Viz orange case easy to find on the job; fits perfectly in the hand and into most tape holsters. Bright yellow blade has clear easy-to-read numerals with cushioned blade return. Removable belt clip. Toggle lock is positioned for convenient operation and holds the blade securely. Easy readability, 7' standout, secure blade lock won?t creep. Special Tru-Zero hook does double-duty as a pivot for drawing circles and arcs. Entire blade coated with Mylar polyester film for added durability, heat-treated spring stands up to repeated use, 16" and 19.2" stud center markings. Three-rivet, corrosion-resistant hook moves for accurate inside/outside measurements. Nylon bond blade protection; 5-point reinforced frame; fractional scale; optimized hood designed for scoring; stamped steel belt clip; lanyard ready. Lightweight, high strength, Hi-Viz orange case easy to find on the job; fits perfectly in the hand and into most tape holsters. Bright yellow blade has clear easy-to-read numerals with cushioned blade return. Removable belt clip. Toggle lock is positioned for convenient operation and holds the blade securely. Wide blade for easy readability with BladeArmor coating on the first 6" that maximizes durability of hook end; mylar polyester film extends life of entire blade and 11' tape standout. High impact ABS case with rubber over mold is jobsite tough, top forward blade lock, 16" and 19.2" stud center markings simplify framing jobs. Cushion grip provides comfortable, slip-resistant hold and hook grabs on side, top or bottom for versatility. Rugged rubber over-mold for impact resistance; 10' Blade Standout for reach and efficiency; Tylon blade coating for durability and long blade life; "Tru-Zero" end hook for accurate measurements; high impact case design for durability. Universal lightweight long steel tape with high impact polystyrene case. Yellow clad blade .005"/0.13mm thick. Easy wind nylon drum; easy-to-read black and red markings. Hook ring is retained neatly in the contoured mouth of the case. Removable belt clip. Graduated feet and inches to 1/8ths with instantaneous readings; 16" centers indicated by a diamond. Metallic ABS case has a wear plate that protects case from cuts and nicks. BladeArmor coating on the first 6" maximizes durability of hook end, Mylar polyester film extends life of entire blade and improves measurement visibility. Forward blade lock design simplifies locking and unlocking the blade, wide blade for easy readability. Three-rivet, corrosion-resistant hook moves for accurate inside/outside measurements, 16" and 19.2" stud center markings simplify framing jobs, 8' tape standout. The first tape to feature a unique new Lufkin design that gives users maximum control when extending and retracting the tape blade; the "Drag Strip" access opening on the bottom of the tape allows users to regulate blade feed and return with their fingertip for greater control, making the tape feel more like an extension of their arm than a hand tool; an integrated tether or wrist strap ring helps prevent drops and injuries; the 10' stand-out capacity and extra-wide end hook make this tape perfect for the toughest jobs. Color: Hi-viz orange. Lightweight, high strength chrome finished case, designed to fit in the hand; fits easily into most tape holsters. Bright yellow blade has clear easy-to-read numerals with toggle lock positioned for convenient operation. Virtually unbreakable Quad Hook, cushioned blade return and removable belt clip. Features two magnets allowing it to easilty connect with any metal object; nylon coated for extra durability; the 1-1/16" wide dual sided blade features large 3/8" markings for quick readings of both elevations; the scale is graduated in 1/16" increments and clearly marked every 1/8" from the 1' mark and up; the wide blade marks off feet as well as inches. Overmold layer of thermoplastic rubber (TPR) for comfort and impact resistance. Ny-Clad nylon powder coated blade lasts longer, 5-rivet reinforced end hook, 3:1 gear ratio for fast blade retrieval. Premium steel blade resists kinks. Black and red blade markings one side only. Graduated feet and inches to 1/8ths with instantaneous readings; 16" centers indicated by a diamond. Open four arm frame design protects blade, does not trap dirt in case, easy to handle and rewind. Yellow clad fiberglass blade impervious to moisture. Two-material grip is comfortable to use, easy to find orange case. Folding end hook for true-zero measurements. Engineer's blade in 10ths and 100ths of feet plus feet. Open four arm frame design protects blade, does not trap dirt in case. Lightweight, strong, easy to handle and rewind, orange case is easy to find and two material grip is comfortable to use. Yellow clad fiberglass blade impervious to moisture. Folding end hook for true-zero measurements. Feet and inches graduated to 8ths; numbered feet and instantaneous feet. Consecutive inches to 16ths on both sides. Vertical read out on back and horizontal on back. 10 foot standout for longer reach and efficient measuring. Reversed color blade for improved legibility in lowlight conditions. Hi-viz green marking for excellent contrast. Matte nylon blade coating in conjunction with black blade offer reduced glare in outdoor applications. Dual end-hook grips on all sides makes marking and measuring easier. Rugged rubber over mold housing for increased impact-resistance. Wide blade for easy readability with BladeArmor coating on the first 6" that maximizes durability of hook end; mylar polyester film extends life of entire blade and 11' tape standout. High impact ABS case with rubber over mold is jobsite tough, top forward blade lock, 16" and 19.2" stud center markings simplify framing jobs. Cushion grip provides comfortable, slip-resistant hold and hook grabs on side, top or bottom for versatility. Well suited for all types of layout and measuring work. The 10' blade standout makes it easy to take those long measurements without the need of an extra set of hands. The blade itself is covered with a protective Mylar coating that helps it resist chipping and cracking. Nylon bond blade protection; 5-point reinforced frame; magnetic hook; finger stop; double sided printing; blue print scale and wire foam belt clip. Easy blade pull out is provided by the blade release button; easy transportation is provided by the spring loaded caribiner attachment; blade life is prolonged due to the rust resistant coating and the dirt removal window is able to empty dust particles inside the tape measure to keep it working at its best. Nylon bond blade protection; 5-point reinforced frame; fractional scale; optimized hood designed for scoring; stamped steel belt clip; lanyard ready. 13 feet of blade standout for increased user reach; extra large end hook grabs construction material from all 4 sides; 3M Thermoplastic film helps to protect blade from damage; mylar blade coating for longer blade life; duo-durometer blade-lock for durability and comfort; wide blade and large numbers make the tape easy to read; heat treated spring for blade durability and smooth rewind and belt clip for easy attachment and storage. Has lots of great features that make it easy for professionals and DIYers to take accurate measurements; with a chrome plated case and a polymer coated blade, you are ensured years of heavy duty use. This tape offers 7' standout; it has a multi-catch hook for versatility with a Tru-Zero hook for accurate inside and outside measurements. Auto Lock mode: for control and long blade life; manual mode: disengage lock for speed marking; detachable hook: allows user to work efficiently in different conditions; 11' blade standout for reach and efficiency; "BladeArmor": 10X blade life; Hook storage: securely stores hook when not in use. Made in USA with global components. 13 feet of blade standout for increased user reach; extra large end hook grabs construction material from all 4 sides; 3M Thermoplastic film helps to protect blade from damage; mylar blade coating for longer blade life; duo-durometer blade-lock for durability and comfort; wide blade and large numbers make the tape easy to read; heat treated spring for blade durability and smooth rewind and belt clip for easy attachment and storage. Wide blade for easy readability with BladeArmor coating on the first 6" that maximizes durability of hook end; mylar polyester film extends life of entire blade and 11' tape standout. High impact ABS case with rubber over mold is jobsite tough, top forward blade lock, 16" and 19.2" stud center markings simplify framing jobs. Cushion grip provides comfortable, slip-resistant hold and hook grabs on side, top or bottom for versatility. Open four arm frame design protects blade, does not trap dirt in case. Lightweight, strong, easy to handle and rewind, orange case is easy to find and two material grip is comfortable to use. Yellow clad fiberglass blade impervious to moisture. Folding end hook for true-zero measurements. Feet and inches graduated to 8ths; numbered feet and instantaneous feet. EXO360? 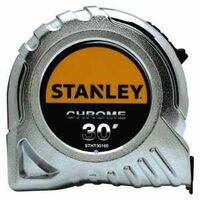 blade technology delivers the longest lasting, rip and wear resistant tape measure blade. Up to 10 ft tape standout. Zero tolerance hook. Finger stop delivers tape retraction control. Fully reinforced body, impact resistant frame survives up to 80 foot drop. Wire foam belt clip. Lanyard ready and functional after 80 foot drop on packed soil. Auto Lock mode: for control and long blade life; manual mode: disengage lock for speed marking; detachable hook: allows user to work efficiently in different conditions; 11' blade standout for reach and efficiency; "BladeArmor": 10X blade life; Hook storage: securely stores hook when not in use. Made in USA with global components. Nylon bond blade protection; 5-point reinforced frame; magnetic hook; finger stop; double sided printing; blue print scale and wire foam belt clip. Tough, molded handle is easy to grasp and rapid reeling with Ultra-glass blade. The crank handle is reinforced with metal to provide years of rugged use. Double throat rollers guide the blade return and prevent the tape from twisting. Double screws to hold the housing together in the event of a drop. Graduations on one side in feet, inches and 8ths; 1/8" hook end hook. Delivers 13 feet of straighter standout to help you measure confidently from a distance. It's engineered to fit comfortably in the palm of your hand with baseball-inspired grip and equipped with our patented Twin-Core? technology for a compact case design. Plus, it's built to last with the longest-lasting blade coating ever applied to a FATMAX? tape measure and two times the BladeArmor? coating to reinforce the hook end. Wide blade for easy readability with BladeArmor coating on the first 6" that maximizes durability of hook end; mylar polyester film extends life of entire blade and 11' tape standout. High impact ABS case with rubber over mold is jobsite tough, top forward blade lock, 16" and 19.2" stud center markings simplify framing jobs. Cushion grip provides comfortable, slip-resistant hold and hook grabs on side, top or bottom for versatility. High-impact yellow ABS case with black rubber, non-slip grip for easy handling. Stainless steel blade for long life and 3 to 1 gear drive for faster rewinds. Tru-Zero end hook for inside and outside measurements. Steel roller cage protects case from being cut by blade during retraction. Open four arm frame design protects blade, does not trap dirt in case. Lightweight, strong, easy to handle and rewind, orange case is easy to find and two material grip is comfortable to use. Yellow clad fiberglass blade impervious to moisture. Folding end hook for true-zero measurements. Feet and inches graduated to 8ths; numbered feet and instantaneous feet. Impact resistant, self-standing case. Heavy duty, 0.008"/0.2mm thick, yellow clad blade protected by an abrasion resistant coating. Extends, rewinds in less time. Easy to read bold black markings with hook ring at zero. Black and red markings 1 side only. Graduated feet and inches to 1/8ths with instantaneous readings; 16" centers indicated by a diamond. Features an impact-resistant PC/ABS case and survives a 60' drop; the built-in lanyard slot offers an additional security option; our toughest blade coating protects the paint and prevents rust longer; integrated lock protection guards the lock button when dropped; guaranteed tough, this tape measure features 9" of heavy-duty thermoplastic coating at the end of the blade to reduce blade breakage near the hook; also features our toughest hook connection - reinforced to reduce blade breakage; the high-carbon steel blade provides 13' of straighter blade standout for increased reach and efficiency; the redesigned screw-free belt clip holds tight and is easy to use. Impact-resistant, open reel,with large soft rubber grip handle. Nylon coating withstands extreme temperatures, water, and chemicals. Crank handle folds flat to prevent breakage. Flexible, high tempered steel tape core. Wear resistant graduations in feet, inches, and 8ths. Numbering starts at hook. Nylon bond blade protection; 5-point reinforced frame; magnetic hook; finger stop; double sided printing; blue print scale and wire foam belt clip. 13 feet of blade standout for increased user reach; extra large end hook grabs construction material from all 4 sides; 3M Thermoplastic film helps to protect blade from damage; mylar blade coating for longer blade life; duo-durometer blade-lock for durability and comfort; wide blade and large numbers make the tape easy to read; heat treated spring for blade durability and smooth rewind and belt clip for easy attachment and storage. Delivers 13 feet of straighter standout to help you measure confidently from a distance. It's engineered to fit comfortably in the palm of your hand with baseball-inspired grip and equipped with our patented Twin-Core? technology for a compact case design. Plus, it's built to last with the longest-lasting blade coating ever applied to a FATMAX? tape measure and two times the BladeArmor? coating to reinforce the hook end. Open four arm frame design protects blade, does not trap dirt in case. Lightweight, strong, easy to handle and rewind, orange case is easy to find and two material grip is comfortable to use. Yellow clad fiberglass blade impervious to moisture. Folding end hook for true-zero measurements. Feet and inches graduated to 8ths; numbered feet and instantaneous feet. Cushion grip provides comfortable, slip resistant hold. Self retracting tape rule with the length of a long tape and the versatility of a spring retractable hand tape. Mylar polyester film extends life of the entire blade, top-forward blade lock, wide blade for easy readability, 11? tape standout. Features an impact-resistant PC/ABS case and survives a 60' drop; the built-in lanyard slot offers an additional security option; our toughest blade coating protects the paint and prevents rust longer; integrated lock protection guards the lock button when dropped; guaranteed tough, this tape measure features 9" of heavy-duty thermoplastic coating at the end of the blade to reduce blade breakage near the hook; also features our toughest hook connection - reinforced to reduce blade breakage; the high-carbon steel blade provides 13' of straighter blade standout for increased reach and efficiency; the redesigned screw-free belt clip holds tight and is easy to use. Interchangeable end hooks for user convenience. Ring end hook snaps onto stake for one person measurements, standard folding end hook for general measuring needs, appraiser's hook attaches to oversized objects such as downspouts. Cushion grips on handle and frame arms for comfort, 3-to-1 rewind for fast blade retraction, 2-sided blade, feet and inches on top, feet to 10ths and 100ths on bottom; 62 fiberglass strands and double-pvc coating for durability and strength. Automatic blade retraction saves time by eliminating manual rewind; rust-resistant coating prolongs blade life; metal case for heavy-duty use; blade-lock securely holds blade in position; spring loaded carabineer attachment for easy transportation. Tough, molded handle is easy to grasp and rapid reeling with Ultra-glass blade. The crank handle is reinforced with metal to provide years of rugged use. Double throat rollers guide the blade return and prevent the tape from twisting. Double screws to hold the housing together in the event of a drop. Graduations on one side in feet, inches and 8ths; 1/8" hook end hook. Break resistant, double nylon coated steel blades, 3/8" wide blade reduces wind drift and tape weight, graduations in 8ths. Metal reinforced crank handle for durability. Double screws to hold the housing together in the event of a drop. Tough, molded handle is easy to grasp and rapid reeling with Ultra-glass blade. The crank handle is reinforced with metal to provide years of rugged use. Double throat rollers guide the blade return and prevent the tape from twisting. Double screws to hold the housing together in the event of a drop. Graduations on one side in feet, inches and 8ths; 1/8" hook end hook. Magnet mounts to metal tool boxes for convenient storage; hi-impact ABS/rubber housing for improved case durability; 9' blade conveniently measures standard drywall and plywood sheets. Break resistant, double nylon coated steel blades, 3/8" wide blade reduces wind drift and tape weight, graduations in 8ths. Metal reinforced crank handle for durability. Double screws to hold the housing together in the event of a drop. Interchangeable end hooks for user convenience. Ring end hook snaps onto stake for one person measurements, standard folding end hook for general measuring needs, appraiser's hook attaches to oversized objects such as downspouts. Cushion grips on handle and frame arms for comfort, 3-to-1 rewind for fast blade retraction, 2-sided blade, feet and inches on top, feet to 10ths and 100ths on bottom; 62 fiberglass strands and double-pvc coating for durability and strength. ABS high impact resistant case. Lightweight, high strength, case fits comfortably in hand; unique slide lock design allows for easy control of tape blade; wide base helps keep tape standing upright; clear coat blade protection for more durable markings; fits easily in most tape holsters. Rubber grip shovel handle for comfortable, rapid reeling, metal crank handle for durability, housing reinforced with rivets for strength. Nylon coated steel tapes are break resistant due to a .2mm thick permanently bonded nylon which is coated, not sprayed, over a sturdy .13mm steel core center. Multi-layer construction assures corrosion resistance to even salt water and provides at least 3 times the usual tape life. Zero point at end of hook; graduations in feet, inches, 8ths. High impact resistant black ABS body. Bold clear numbers on bright yellow tape. Rigid blade with protective acrylic coating. Durable steel belt clip. Dependable slide lock.